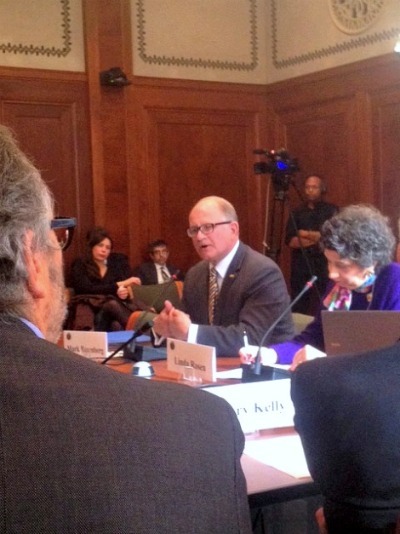 FIU President Mark B. Rosenberg made a presentation to the President’s Council of Advisors on Science and Technology (PCAST) at the National Academy of Sciences Friday, Nov. 30, in which he shared the innovative approaches underway at FIU that advance science, technology, engineering and math (STEM) education. The administration and PCAST are currently developing a federal strategic plan for STEM education and were interested in learning from FIU’s successes, particularly as they relate to underrepresented minorities. President Rosenberg sharing FIU’s successes with PCAST members. PCAST is an advisory group of the nation’s leading scientists and engineers who directly advise the president and the Executive Office of the President. Joining Rosenberg in Washington, D.C., were Kenneth G. Furton, dean of the College of Arts & Sciences; and Laird Kramer, director of the STEM Transformation Institute. Among the PCAST members in attendance were Eric Schmidt, executive chairman and former CEO of Google; Craig Mundie, chief research and strategy officer at Microsoft; and Eric Lander, founding director at the Broad Institute of MIT and Harvard and leading contributor to the Human Genome Project. Rosenberg spoke of FIU’s success in attracting underrepresented minorities to STEM fields, as well as creating innovative instructional methods to increase student’s success, such as modeling instruction and peer-led learning. FIU’s STEM Transformation Institute was showcased as an example of FIU’s efforts to spark student interest in STEM disciplines. The president also shared the story of Idaykis Rodriguez, a physics Ph.D. candidate, who was one of 550 students worldwide to be invited to the 62nd Lindau Nobel Laureate Meetings in Germany this year. Watch Rosenberg’s presentation here (his remarks begin at 15:30), or read a transcript here. To learn more about the breadth of STEM reforms at FIU click here. Follow Federal Relations on Facebook and Twitter for more updates.